My school cafeteria served the predecessor to sad desk lunch. Kids would take the rubbery cheese out of the stuff crust pizza and see if they could bounce it; "turkey and gravy on a biscuit" contained "real meat"; and the salad bar’s lettuce was limp enough to make a gas station salad seem appealing. The only time school lunch was worth buying? 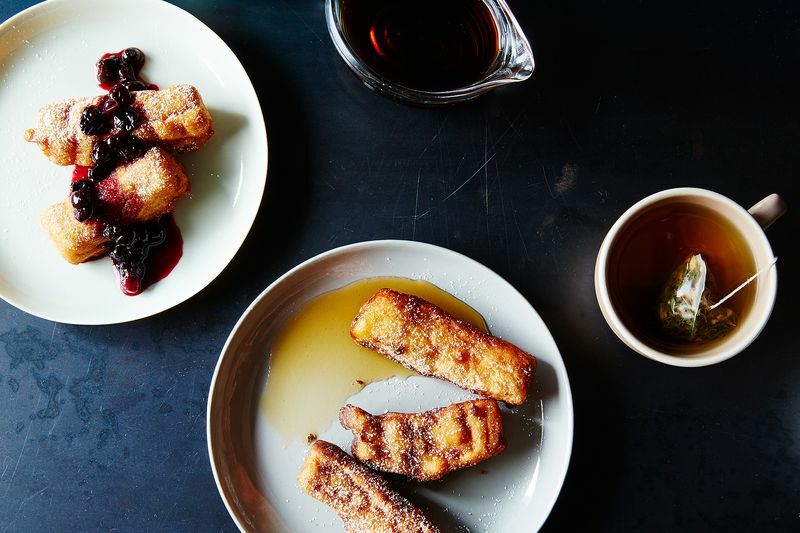 French toast stick day. Before entering elementary school, I’d never had French toast sticks. (I probably had French toast, though—my parents aren’t cruel enough to withhold all the great breakfast things.) Sure, you can eat French toast in slice form, but sticks are far superior. There’s just something so visceral about these vanilla-y, egg-coated soldiers. Maybe it’s the way you can dunk them in a tiny saucer of syrup, or the imminent danger of sticky fingers, or the choice to either eating them with a fork and knife or with your hands. 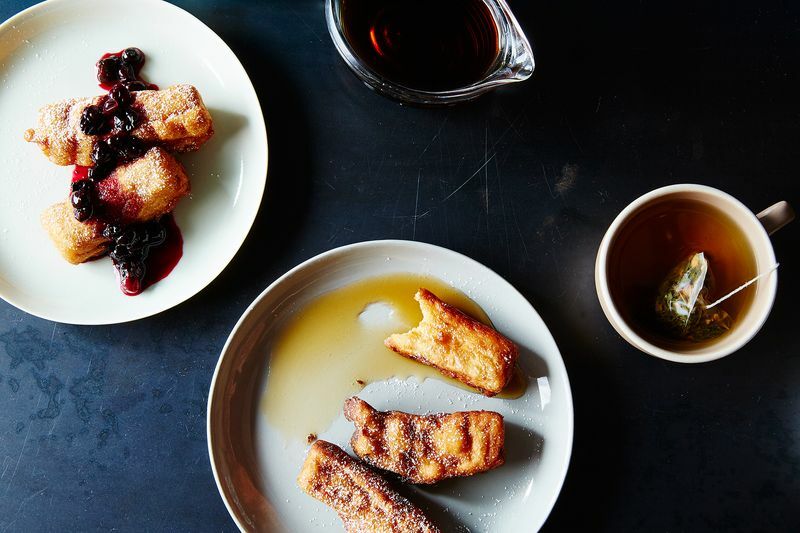 Try picking up a slice of regular ol’ French toast. See? Not nearly as enjoyable of an experience. While I’m not entirely sure of how my school cafeteria made their French toast sticks, or rather how whatever industrial food supplier they bought their meals from did, I can promise the method described below does not come close—and I mean this in the best way possible. Firstly, we’re working with leftover brioche or challah. You can use other types of bread, but the result will not be nearly as rich and will therefore be sad. Sad French toast sticks aren’t allowed. Secondly, we’re not just taking a French toast batter and applying it to sticks. No, this batter’s spiced with cinnamon, nutmeg, ginger, and cloves and acts as a coating. 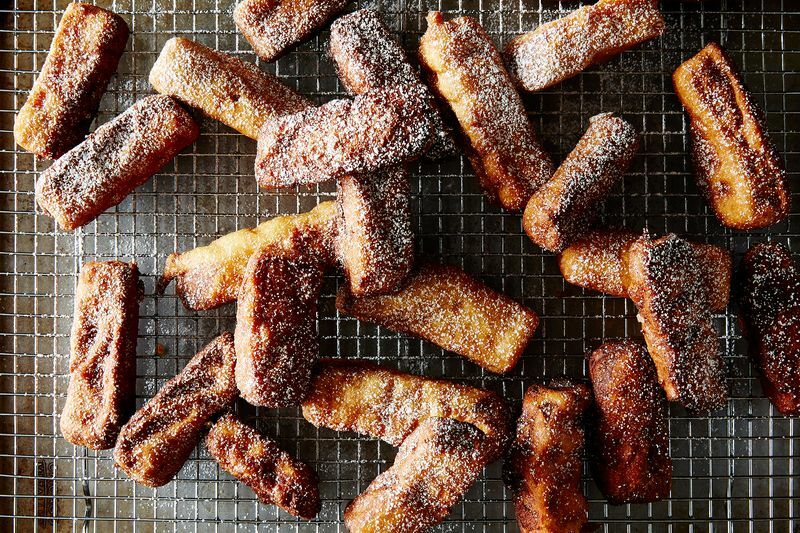 Which, brings us to point three: French toast sticks are meant to be deep-fried. 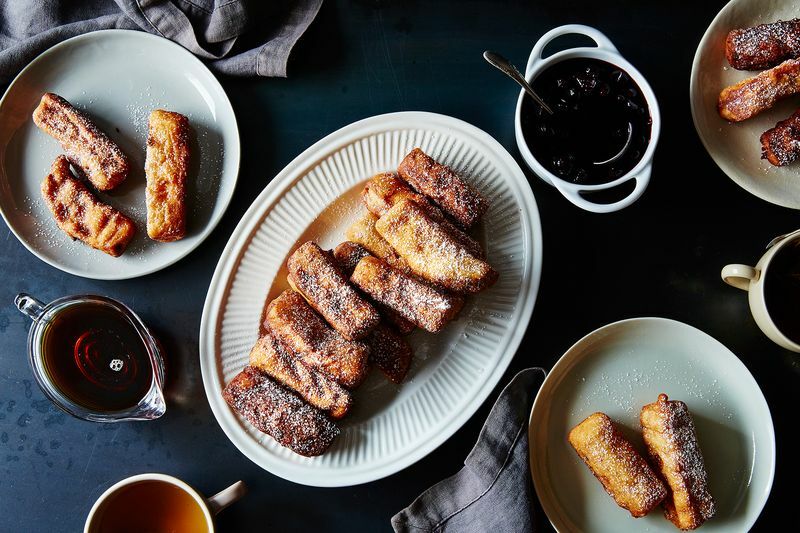 They get crunchy and caramelized on the outside thanks to the flour and sugar, yet remain soft and pillowy on the inside in the best French toast way. Confectioners' sugar and maple syrup are a must for serving. No one will be mad if there’s some sliced fruit or perhaps an apple compote alongside either. Eating these for lunch is, of course, a great idea—no school cafeteria required. For the batter, mix all the dry ingredients (flour through cloves) in a large bowl. In another bowl, whisk together the buttermilk, eggs, and vanilla extract. Pour the wet into the dry ingredients and fold, using a spatula, until just combined. The batter might be a little lumpy and that’s perfectly fine, just make sure not to overmix. In batches, immerse a few of the sticks into the batter and let sit for 3 minutes. Transfer the bread sticks to a wire rack set over a baking sheet to drain while the oil heats. In a large, deep skillet, heat about 1 1/2 inches vegetable oil over high heat until it reads 350° F on a deep-fat thermometer. 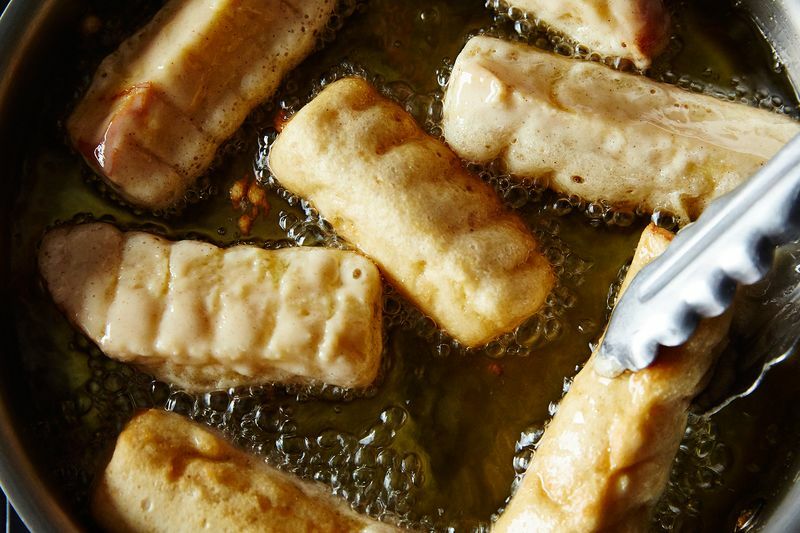 Working with a few at a time, fry the bread sticks for 3 minutes, flip, and fry on the second side until golden brown. Drain on paper towels. Dust with confectioners’ sugar, drizzle with maple syrup (or serve some in a cup alongside for dunking), and serve with fruit or any of its iterations, if you like. Serve immediately. Can you freeze them before frying for use later? Or perhaps par-cook them in the fryer first to set the batter, then freeze them? What do you think would be best...? This recipe is the bomb! There is enough batter to make a full loaf of Texas toast. Tastes even better than the sticks I remember from school! Oh yes, yes, YES! 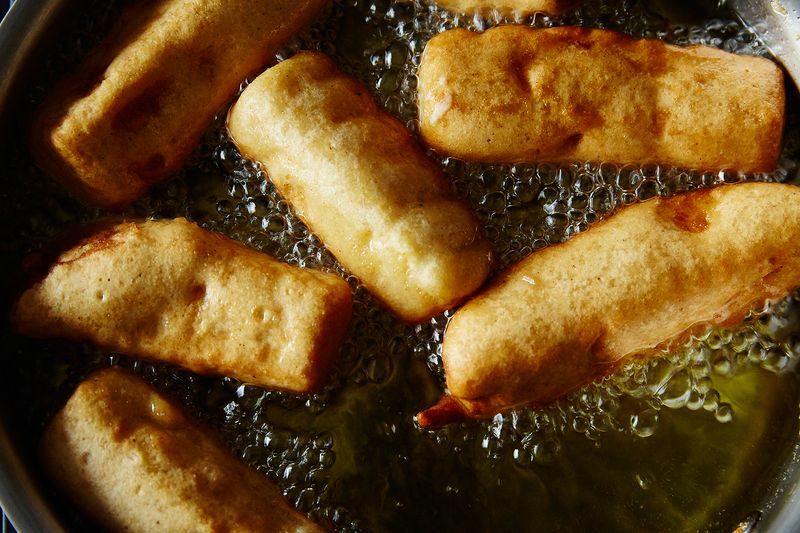 I never deep fry anything- but I'll make an exception for this recipe- looks delicious. This looks amazing! Surely keeping this for future reference. I have eaten these. And they were INCREDIBLE. These look just so completely addictive. I don't think I could just eat a few. When I was a teacher you could always tell they were serving French toast sticks because the kids all smelled like syrup.